Warren Moran, New Zealand Wine: The Land, the Vines, and the People (Hardie Grant, 2017). John Schreiner, Icon: Flagship Wines from British Columbia’s Best Wineries (Touchwood Editions, 2017). I’ve always thought that New Zealand and British Columbia have a lot in common. Both are spectacularly beautiful places with warm, welcoming people. The wild areas near Tofino on Vancouver Island remind me a bit of the wild areas on the north coast of New Zealand’s South Island. And both Auckland and Vancouver have a distinctly cosmopolitan feel. There are some wine similarities, too. Romeo Bragato, the visionary who planted the seeds of today’s Kiwi wine industry more than a hundred years ago fled New Zealand when prohibitionists took charge and cut funding for this research. His new home? British Columbia! The wine industries in both BC and its Kiwi cousin have experienced dramatic ups and downs over the years and both are on the rise today, inspiring books that survey what has been accomplished. There is a strong sense of history in Warren Moran’s book about New Zealand wine. Moran has been in the mix of Kiwi wine since the 1950s and you can tell that he wants to record all that he has seen, the people he has known, and the wines he’s experienced. I especially appreciate the attention to detail I found here as Moran careful lays out the evolution of the wine industry that brought New Zealand to its current place as one of the world’s premier wine-growing countries. Moran is a geographer, professor emeritus at the University of Auckland, and pretty good story-teller. He organizes his book around two revolutions that have shaped Kiwi wine, a regional revolution, where winegrowers searched for the best places to grow their grapes, and a varietal revolution, where they experimented with grape varieties. New Zealand’s most famous wine, Marlborough Sauvignon Blanc, is the result of this double revolution, but it is a mistake to identify Kiwi wine with this one grape variety and winegrowing region. Indeed, Moran’s detailed account highlights the great (and sometimes underappreciated) diversity of New Zealand wine. I especially appreciate the maps and historical photos found here. I have several of John Schreiner’s books on my shelf and I consult them whenever I head north to visit the British Columbia wine country. Schreiner’s knowledge of B.C. wine is every bit as deep as Moran’s Kiwi wine expertise. Icon‘s focus is on what has been achieved in British Columbia wine, leaving the full story of how it happened to Schreiner’s other books. Because B.C. is less well known that New Zealand in the wine world, this focus is quite useful and hopefully this book will draw more attention to the region and its wines. New Zealand wines are everywhere here in the U.S. market whereas B.C. wines are mainly represented by Ice Wine. If you want to know what else B.C. has to offer you pretty much have to go to the source. This volume just might be the nudge you need to book that ticket! Shreiner identifies about 100 noteworthy wineries, focusing in most cases a single iconic wine. Schreiner provides a few paragraphs about the winery, the winemaker, and the wine followed by tasting notes, which are sometimes Schreiner’s own but often taken from the winery’s release notes (I wish Schreiner had written all the notes, but that wasn’t practical, he tells us). Each winery gets two pages for the story, the notes, and a bottle shot and, while I can see the logic of this structure (all icons are equally iconic), I sometimes felt like the editorial format got in the way of the story. I wish Schreiner could have drawn upon his deep understanding to tell us more — giving more space to particular influential wineries, for example, or perhaps organizing them regionally or historically rather than according to the alphabet. The book is already 300+ pages, however, so something would have to be cut — some of the wineries or Christopher Stenberg’s beautiful photographs. A difficult decision. Icon ends with a list of wineries that have the potential to join the icon list in the future, which is appropriate. British Columbia has achieved so much when it comes to wine and its future looks especially bright. You can bet that Icon will be in my backpack the next time I point the GPS for B.C.! Milestones. Do they mark how far you have come on a journey? Or do they tell you how far you’ve left to go? Both, I guess, which gives them a (wine) glass half full / half empty quality that invites contemplation. Canada and Canadian wine have reached important milestones recently and I think there is something to gain in contemplating them in tandem. 2017 is the 150th anniversary of Canada’s confederation — a significant milestone in its national history. The past 150 years have not always been easy. Canada has been rocked both by external events (world war, global depressions, financial crises) and domestic social and political conflicts, too. Canada’s version of federalism gives even more autonomy to its provinces than U.S. federalism gives to its states. The balance between federal and provincial interests has not always been smooth and tensions among the provinces (and even within them) and their people and cultures have not always been easily reconciled. Canada has somehow negotiated these challenges and emerged, on its 150th birthday, in an admirable state — prosperous, generous (especially regarding refugee immigrants) and widely respected. O Canada, indeed! 150 years is an important milestone, but nobody thinks Canada’s story is over. The future is sure to be full of challenges as the road twists and turns, rises and falls. But Canada and Canadians can look forward to the journey with confidence. July 24, 2017 is another important milestone. It is the day Howard Soon retired as Master Winemaker for Sandhill Wine in Kelowna, British Columbia, after an amazing 37 vintages. Soon is the dean of Canadian winemakers and this milestone is reason enough to celebrate his amazing career and Canadian wine, too. The grandson of Chinese immigrants, Soon initially took his biochemistry degree from the University of British Columbia into the brewing industry before making a fateful pivot to wine, working his way from quality control to assistant winemaker to winemaker for Colona Vineyards, one of Canada’s largest wine firms. The Canadian wine industry has changed dramatically over Soon’s remarkable winemaking tenure as it faced market challenges that are both external (increased competition from the United States after the NAFTA treaty) and domestic (the lack of a true “Canadian” wine market because of strong provincial control over alcohol sales). Soon has played an important role in helping the industry to weather the storms by setting a course to higher and higher quality. When Sue and I first visited Vancouver many years ago the sommeliers refused to serve Canadian wines — they simply wouldn’t do it. It was an over-reaction because there were some good wines even back then, but an indication of their poor reputation These days, however, there is obvious pride in the wines all around and they are proudly featured and served. Soon and his winemaking colleagues have both changed Canadian wine for the better and they have done something even more difficult — they have changed the way Canadians think about their wines. Quite an achievement. Soon’s most recent project, Sandhill Vineyards, is in the vanguard of the quality movement (Sandhill appears in my next book Around the World in Eighty Wines). It was founded twenty years ago with the idea to feature terroir through a series of small production single-vineyard wines. Soon has received virtually every recognition that Canadian wine has to offer and he reaches the retirement milestone at the top of his game. His signature 2014 Howard Soon Sandhill red wine was recently named #1 red wine of the year in the All Canadian Wine Championships. Howard Soon and Canadian wine have come a long way but they both seem to have arrived at this mile post with enthusiasm to move forward to reach new goals. Sue and I had dinner recently with Howard and his wife Wendy. Howard told us he plans to spend more time with Wendy and their kids and grand kids. But the same drive that has pushed him to this milestone seems likely to carry him ahead to new challenges and adventures. Great winemakers like Richard Peterson and John Duval, to name just two, seem to move from one mile-marker to the next, always looking forward. It will be interesting to see where the wine road takes Howard Soon! What’s the Big Deal about Supermarket Wine Sales in British Columbia? What’s the big deal about British Columbia supermarket wine sales? It is a very big deal in some circles because the stakes are higher than they might seem. Here’s my analysis of the situation. Supermarkets are an important wine sales vector in the United Kingdom and most but not all U.S. states, so many consumers take it for granted that they can walk into their local Safeway, Kroger-affiliate, Whole Foods or Trader Joe’s store and be greeted by a world of wine choices. Things are a bit different in Canada. Provincial alcoholic beverage control regimes apply somewhat in the spirit of Sweden’s Systembolaget monopoly, which was at one time the world’s largest wine retailer — a title that I think passed to the Ontario Liquor Control Board store system before being taken up by Tesco, the British supermarket giant. British Columbia is moving towards expanded supermarket wine sales after some preliminary trials. The process is a bit awkward because there are many stakeholders with vested interests in the old control system of wine sales. Moving to supermarket sales may increase total wine sales, but the “trade creation” will be accompanied by a certain amount of “trade diversion” from other retailers, who are understandably unhappy. There is lots of push back as you would expect. The political economy of B.C. supermarket wine sales is both domestic (more supermarket sales at the expense of existing wine sales license holders) and also international. Incredibly, the B.C. regulations exclude non-B.C. wines from regular supermarket shelves (imported wine may theoretically be sold in a separate and costly and somewhat inconvenient “store within a store”). This has produced an international dust up as the United States has brought charges at the World Trade Organization over the discriminatory practice, an action that the European Union and New Zealand have also supported. The list of wine exporting countries lined up against the B.C. supermarket regime continues to grow. Argentina recently joined the US in this action and Australia quickly followed suit..
What is the problem? Can’t British Columbia to what it wants regarding wine retail regulations? Maybe not, because Canada (along with most of the world’s nations) is a member of the World Trade Organization (WTO) and is bound by its rules. The World Trade Organization is actually a fairly weak international institution. It has spent the last couple of decades trying and failing to reach a global agreement on trade liberalization. But the WTO (through its predecessor, the General Agreement on Tariffs and Trade or GATT) was founded on two very strong principles: Most-favored-nation (MFN) treatment and non-discrimination. Most-favored nation treatment prohibits a country from discriminating at the border against the goods of one WTO-member trading partner relative to others in terms of tariffs and so forth. Every country gets the deal that the most-favored country gets. You cannot single out one country for better treatment or — the real fear — impose sanctions against another except in well-defined circumstances. This was one reason why China worked so hard to get into the WTO — to limit the threat of a trade war against its products. The MFN rule has been diluted somewhat in recent years as bi-lateral and multi-lateral preferential trade agreements like NAFTA have become more important. (The rise of preferential agreements is often seen as a reaction to the inability of the WTO to produce agreements on broader, global trade regimes) These agreements allow a certain amount of systematic positive discrimination in favor of fellow trade block members. The MFN rule still controls negative “trade war” discrimination. The second rule, the non-discrimination principle, holds that once a product enters a country, paying whatever legal tariffs are levied at the border, it cannot suffer internal discrimination because of its import status. It must be treated from a regulatory standpoint just as domestic products are treated. That’s a powerful principle. I am an economist, not a lawyer, but it seems to be that allowing domestic B.C. wines to be sold in supermarkets while prevented equal access to legally-imported California, France, New Zealand or Australia wines would seem to be a violation of the non-discrimination principle and actionable under WTO rules. I was aware of some discussion of possible US action through the WTO as the BC supermarket protocols were being developed, but the US threat was taken lightly by some north of the border. The BC market is relatively small (we are not talking Ontario here) and there are substantial costs to initiating a WTO action, which can take years to resolve and burn up a lot of attorney fees in the process. Not worth the trouble! So some people in BC were surprised when the US finally acted. But I was not surprised. While BC market losses might be relatively small for international wines, they establish a precedent that could be important if the local-product-only supermarket sales idea spreads — to Ontario, for example. And there might be other discriminatory practices that apply in Canada and its provinces that need to be studied — the supermarket rule might have been the tipping point to take action. Finally, there is a more global concern. We seem to be living through a period when protectionist rhetoric is in the air and actions that challenge or violate the rules of fair trade are seriously proposed. In this environment, it is in the interest of global industries like wine to resist the protectionist tide wherever possible on the grounds of both principle and interest (self-interest, that is). We recently returned from an “extreme wine” research trip to the surprising Okanagan wine region in British Columbia (click here to read part one of the series). Surprising? Well, many U.S. wine drinkers find the very idea of Canadian wine surprising (ice wines apart), which is understandable since only a handful of wineries have successfully navigated the process to get distribution south of the border. The wines themselves hold many surprises, if you can find them. And then there are the wine tourism opportunities. Wow! For a lot of people, this will be the biggest surprise of all. Wine tourism has become big business as enthusiasts seek closer links to their favorite wineries, wine producers try to make more high margin direct sales and the hospitality industry has embraced the wine tourism trend. George Taber has written a fascinating book, In Search of Bacchus, that surveys the global wine tourist scene and gives a sense of the industry’s rising profile. Wine tourism is a naturally appealing — even if you omit the wine! — because vineyards and wineries are often located in areas of real scenic beauty. But wine tourism in many areas has been slow to develop because vineyards are agricultural zones often lacking in the expected tourist infrastructure and amenities. And at some point as more people arrive there is tension between farming and tourism. The debate over the Napa wine train captures some of this problem. 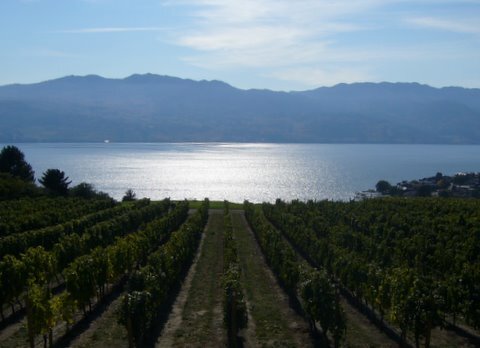 The Okanagan wine region in British Columbia has a decided advantage over most winegrowing regions. Usually the wine comes first and then the tourist infrastructure slowly develops. It’s the other way ’round here. The Okanagan region has spectacular scenery with four season sports and recreation opportunities that have long attracted visitors. At the center of it all is beautiful Lake Okanagan, a long narrow north-south body of water that feels like a fjord and has just about everything a tourist might desire, including a resident Lake Monster named Ogopogo. Wine grapes are known to love to look down on lakes and rivers and so do people, of course. So the Okanagan developed its tourist infrastructure long before the current wine boom (which I’ll discuss in an upcoming blog post). We benefited from this timely development on our trip, staying right on the lake at the Summerland Waterfront Resort in Summerland, B.C. and enjoying meals made from regional ingredients at Local, a restaurant just next door. Sipping wine in the evening with the fireplace roaring, looking out across the lake to the vineyards on the Naramata Bench — well wine tourism does not get much better than this. As this region’s wine industry developed from the 1990s on, many wineries made very significant investments in wine tourist facilities — partly, I think, because of the need to compete with and complement the amenities already here in order to attract tourist business. Direct sales of the kind that wine tourists provide are extremely important to wineries in this region. Every wine maker I talked to noted the cost and difficulty of getting distribution in other Candadian provinces to say nothing of entering the U.S. market. Direct sales are therefore key and tourists from Vancouver in the west, Alberta in the east and the U.S. down south are a big part of that business. Burrowing Owl Estate Winery in Oliver a good example of a B.C. destination winery. Perched on a hillside, it is a beautiful facility in a great location that includes the winery, a tasting room, restaurant and an inn with a swimming pool. A must stop on the wine tourist trail, they count on cellar door sales to move most of their substantial annual production. Wine economics note: tasting room fees are still very low in this region — amazingly low for anyone who has visited Napa Valley lately. Most of the wineries I visited offered free tastings for a limited number of wines. At Burrowing Owl, a $2 donation was encouraged — the money goes to the a nature conservancy group. The ultimate wine tourist destination in the Okanagan Valley must be Mission Hill Winery. Inspired by Robert Mondavi’s iconic winery in Oakville, Mission Hill sits atop a peak and looks out over the lake. The winery is stunning, with an entry arch that immediately made me think of the Mondavi winery and a soaring bell tower. Everything inside is strictly first class, too, including comprehensive tours that end with sommelier-led tastings from your souvenir Riedel glass. As beautiful as the building is, I don’t seem to have taken any photos of it. I guess I couldn’t resist the view (shown above) looking down over vineyards to the lake below. I wasn’t alone: members of a photography club were buzzing around like bees making images of the vineyards, grapes, rose bushes, bell tower and, inevitably and unintentionally, each other. Mission Hill is the cherry on the Okanagan wine tourism cake. Altogether, this wine region is quite a treat and sure to grow in popularity as the word gets out. We’ll be back — possibly staying at one of the guest ranches in the area, horseback riding in the morning and wine touring in the afternoon, or perhaps taking advantage of vineyard lodgings like the ones at Working Horse Winery. This is the second of my “extreme wine” reports on the Okanagan wine scene. Watch for the final post (on the region’s future) in a few days.